Il giardino degli Iris - FLORENCE LIVE! 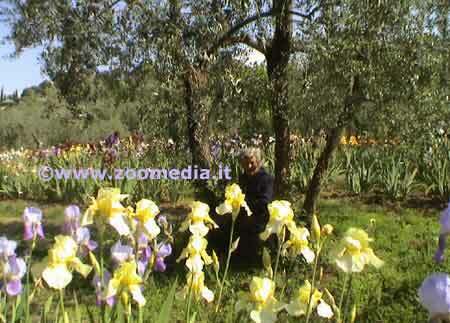 The "Garden of the Iris", situated on the corner of Viale dei Colli and Piazzale Michelangelo, belongs to the iris-growers' society. The flower is of great importance to Florence and has been the symbol of the city since 1251. The iris garden is given over almost entirely to this flower, hundreds of varieties of which are grown here, including, of course, the main genus. At the height of the flowering season more than 1,500 strains of iris from all parts of the world can be admired here. 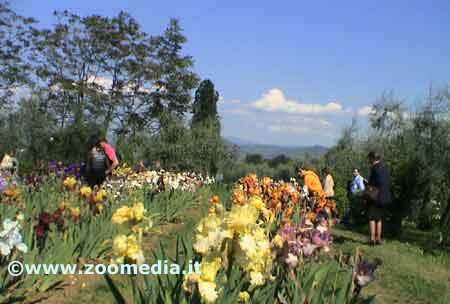 The garden, which is located on the eastern side of the hill on which Piazzale Michelangelo stands, blends beautifully with the hillside olive-grove environment in which it lies, with lawns alternating with flower-beds and a small lake in which the aquatic varieties of iris are cultivated.